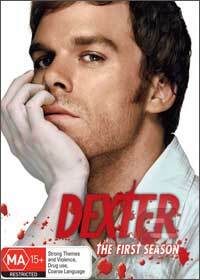 Michael C. Hall, brilliantly leads this series as Dexter; a Miami blood splatter analyst who when not solving murders, is committing them as a strange form of vigilante. Of course his insider knowledge comes in handy during investigations, until he finds the perfect crime scene. Dexter soon becomes obsessed with this serial killer, nicknamed the ice-truck killer. The series follows the cat and mouse game Dexter plays with the ice-truck killer both at work and progressively in his private life. This is an amazingly written crime show, based on the book Darkly Dreaming Dexter by Jeff Lindsay. Dexter certainly isn't the average serial killer and the series' progressively explores how and why he became what it is. Essentially Dexter is a mystery series, though like Showtime's other productions (Deadwood, Queer as folk) it will not appeal to all sensibilities. But for those aren't too squeamish, this is a fantastically gripping show.